The concept of natural born Citizenship is clear and concise, to anyone with a rational mind. Although some may wish to contort its meaning to fit the presidential candidate of their choice, natural law is incapable of such bias. It takes two parents to produce a child, one male and one female, but you would never know it if your source of information is the lamestream media. By its logic, only one parent is sufficient. Epigrammatically speaking, if both of your parents were U.S. Citizens at the time of your birth, you are without question a natural born Citizen of the United States. The location of your birth matters little. 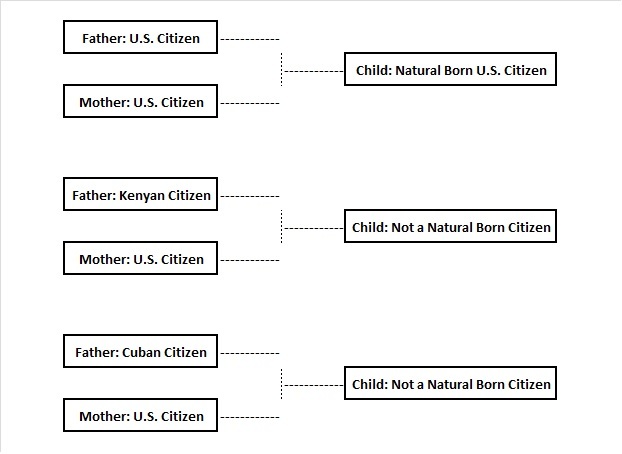 You could have been born in Kenya, Canada, Panama, or perhaps on the Moon, but as long as both parents were U.S. Citizens, at the time of your birth, you are without question a natural born Citizen. 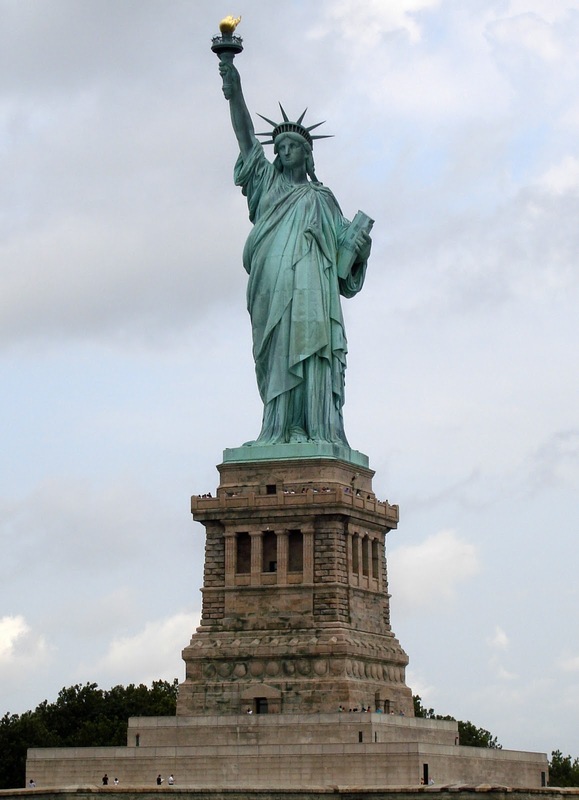 You can think of natural born citizenship as free and clear citizenship. In other words, the rights of the parents (plural) are passed to their children. Thus, when both parents are U.S. Citizens, their offspring are natural born U.S. Citizens, free and clear. No other country has a claim of right. Comprende? However, if at the time of your birth, your father was a Citizen of Kenya and your mother of the U.S., this would pose a problem. Oh no! What’s the problem? The problem is duality. Under such circumstances, the child would be a Citizen of Kenya (a British subject pre-1964) by virtue of its father, and equally a Citizen of the United States by virtue of its mother. There’s nothing free and clear in this circumstance. Upon the age of consent, such a child may claim citizenship with one country or the other; however, citizenship does not equal natural born citizenship. You might not like the result of the above graphic, but that’s simply the way it is. Here are some recent examples. Is John McCain a natural born Citizen? John McCain’s parents were both U.S. Citizens at the time of his birth, thus he is a natural born Citizen. It matters not that he was born on a military base in Panama. He could have been born in Siberia. No matter where he was born, McCain is a natural born American Citizen by virtue of his parent’s common nationality, at the time of his birth. You got that? Is Ted Cruz a natural born Citizen? Ted Cruz’s father was a Cuban Citizen and his mother a U.S. Citizen, at the time of his birth. Thus, whether born in the U.S., Cuba, or Canada (where he was actually born) he is not a natural born Citizen of either. Cruz was born with citizenship rights to Cuba, Canada and the United States. Although he may have chosen U.S. citizenship, at the age of majority, natural born citizenship is not something one chooses. Natural born citizenship is a right passed from one’s parents at birth. As such, Ted Cruz is no more a natural born Citizen than is Barack Obama. The U.S. is filled with undocumented aliens, birthright Citizens, permanent residents, dual status Citizens, naturalized Citizens, and natural born Citizens. Whether the children of undocumented foreigners, born on U.S. soil, are U.S. Citizens by birthright is questionable. However, without question, such children are not natural born Citizens of the United States. The main issue is this. According to Article 2, Section 1, Clause 5 of the U.S. Constitution, “No Person except a natural born Citizen shall be eligible to the Office of President.” So where does that leave Ted Cruz? Is he a U.S. Citizen? Sure, if he affirmed. Is he a natural born Citizen? Due to the citizenship status of his parent’s, at the time of his birth, he clearly is not. Is Ted Cruz eligible to run for the presidency? Technically no, since he is not a natural born Citizen. But since you allowed Barack Obama, who is plain as day not a natural born Citizen, why stop Ted Cruz or anyone else for that matter? If it weren’t for that confounded Constitution, we could nominate whomever we yearned, without conscience. But, since we do have a blessed Constitution, it’s up to us, rather than fainthearted federal judges, to see that it is upheld. On October 2nd, President Barack Obama correctly uttered, “I am not on the ballot this fall… But make no mistake: these policies are on the ballot. Every single one of them.” True, Obama is ‘Not’ on the ballot this fall, but he neglected to mention that his left-hand henchman, the one responsible for ramming through Obamacare without any Republican support, for killing more legislation passed by the people’s house than any other Senate majority leader in U.S. history, and the second most divisive and hated man in American politics today, Harry Reid is. Just yesterday, a client lamented to me that she and her husband’s health insurance is going up by $1,000 a month next year, from around $526 per month to $1,526, and that they were in process of exploring other options. During the same conversation, she happened to mention that she wasn’t sure who to vote for this fall, Michelle Nunn or David Perdue. She heard some things about Perdue that she’s “not comfortable with”. I exclaimed, “You don’t know who to vote for?” I’m going to share with you what I told her and how I really feel. I didn’t get the joke. The truth is that if I thought it would do any good, and if I could go back in time, I would move to Nevada myself, for the sole purpose of voting Harry Reid out of office. When Harry Reid ran for re-election in 2010, I felt powerless and utterly disgusted as I watched Nevadan’s vote against their own, and America’s interests. Whether Reid runs for re-election in 2016 is up in the air. Questions about the 74-year-old’s health, among other things, lead some knowledgeable insiders to speculate that he will retire rather than face a challenge in 2016. Fortunately for us, Harry Reid is on the ballot this year. 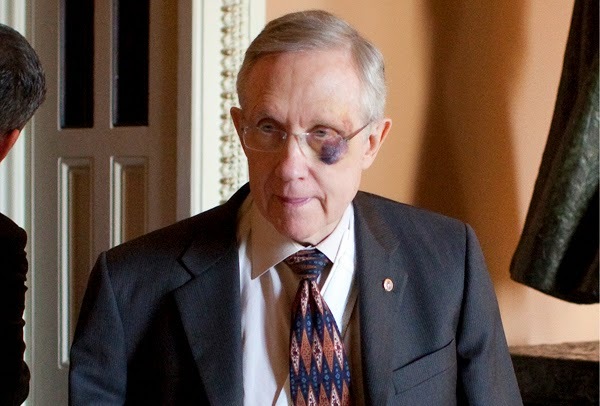 There are 36 U.S. Senate seats up for election in 2014, and Harry Reid’s fate is on the line in each and every race. This is our chance. This is our moment. We finally have a shot at decapitating the second most hated SOB in American politics today, and we don’t even have to leave home. It boils down to this. If you want to keep Harry Reid in power, then go ahead and cast your vote for Michelle Nunn (or the Harry Reid clone in your state). But, if like me, you’re sick and tired of partisan politics, and want to send a direct message of your disgust to Washington D.C., by delivering a pink slip directly to Harry Reid’s desk, then it’s real simple. Vote against the Democratic U.S. Senate candidate this fall, and vote for the Republican candidate. A vote for Michelle Nunn is a vote for Harry Reid, and a vote for David Perdue is a vote against Harry Reid. 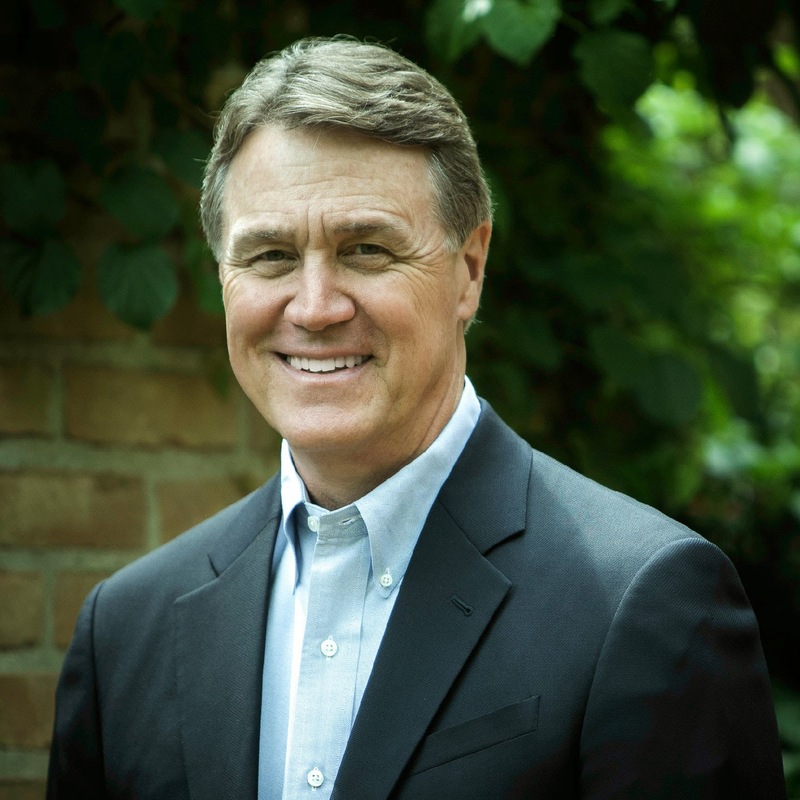 This year I’m voting against Harry Reid, and therefore in favor of David Perdue. What’s so wrong with this plan? It sounds a lot better than the utter chaos we have today. The pilot program proposed for Honduras would allegedly cost up to $47 million over two years, under the assumption that 5,000 refugees would apply, and about 1,750 would be accepted. What’s so bad about that? The only flaw I can find is that because 16,500 unaccompanied children have arrived from Honduras, just since October 1st (over the last 9 months), actually up to 44,000 could apply for refugee status over a 24-month period ((16,500 / 9) * 24). That means this pilot program could actually wind up costing upwards of $413.6 million (($47 million / 5,000) * 44,000). Oops! Furthermore, since the population of Honduras (under the age of 15) is around 2.8 million, assuming they all want to exit, the program could last for upwards of 127 years, with a total cost of around $26.3 billion ($413.6 million * 63.5 two-year periods). With an acceptance rate of 35%, we could wind up with around 981,584 Honduran refugees over the next 127 years. But that’s not the end of this proposal. Since the program would then be adopted in Guatemala and El Salvador, which have populations (under the age of 15) of 6.0 million, and 2.0 million, respectively, again assuming all want to join us, the program could last for upwards of 270 years (concurrently), with a total cost of around $101.0 billion, assuming similar costs in all three countries. All in all, we could wind up taking in 3.8 million refugees, at a cost of around $101 billion, over the next 270 years. But keep in mind; this only includes the cost of processing and transporting them to the United States. It does not include the cost of feeding, educating, housing, etc… And then where does it end? How many other countries could declare worse crises? Does this still sound like a great plan? Not so much. Even Permanent (aka. Legal) U.S. Residents are not citizens and thus cannot vote. One must be over the age of 18, and have been a permanent resident of the U.S. for 5 years before he or she can apply for citizenship. Once citizenship is applied for, and one passes the test and pays the $700 fee, then, and only then, is he or she eligible to vote. Assuming citizenship is attained, how such a person chooses to vote is a matter of personal preference, influenced by individual life experiences. Perhaps it’s time Conservatives forget about some fantasy election decades away, and focus on things that really matter, like the potentially ridiculous overall cost of this never-ending scheme. Really? Are we the only developed country on Earth where school and mass shootings occur? Well, I guess that depends on ones definition of the word “developed“, as well as upon which Earth one happens to reside (i.e. apparently there is more than one). Granted the term “developed” would exclude the entire Middle-East, where mass killings are interwoven with religious dogma and thus a way of life, whenever I hear code words like “every”, or “only”, they generally precede a gross exaggeration, mass deception or an outright lie. Ironically, in this case, at nearly the very moment Potus attempted to twist our emotions, over what seemed like a rash of public-school kids losing their minds (at the hand of the US Department of Education), the US Central Intelligence Agency (CIA) resumed its deadly drone attacks in Pakistan, perhaps encouraging the next mass killer. US drone strikes hit houses in Dande Darpa Khel village in Pakistan’s North Waziristan on Wednesday and early Thursday, leaving at least 16 people dead. But I guess that’s okay, because after all we’re at war with Pakistan, right? And, war always involves covertly firing missiles into the personal residences of one’s enemy, regardless of whether school-aged children are present. Coincidentally, earlier this month, a Wall Street Journal report said that during secret negotiations over the release of Bowe Bergdahl, the Taliban warned Washington that its drone attacks had come close to killing him on several occasions. Thus, the CIA halted attacks for around 6 months, resuming immediately after his release. Well what do you know; maybe the poor fella’s life really was in danger. Now here’s the Catch-22. US drone strikes have killed hundreds of civilians in several Muslim countries including Yemen, Somalia, Afghanistan, and Pakistan. And, according to Ben Emmerson, a UN human rights investigator, the death toll of civilians in US drone strikes in Afghanistan and Yemen continues to rise. So although I feel Potus 44’s concern over 12-year-olds flipping out in government-run schools, rather than his preoccupation with upending US laws, currently protecting more people than they harm, perhaps he should focus on his own murderous policies. Granted that none of the above are considered “developed” countries, as implied by Potus 44, and thus really don’t matter all that much, it’s pretty far from okay when the very dude responsible for mass killings around the globe tries to convince the rest of us that we are the problem. Potus 44 continued, “The United States does not have a monopoly on crazy people.” Well, you got that right. “And yet we kill each other in these mass shootings at rates that are exponentially higher than any place else.” Wait! We kill each other? Hmmm, well that’s kind of a tough sale. And we do so at rates exponentially higher than any place else? Where’s the backup? Following is a non-exhaustive list of school and mass shootings in developed and semi-developed countries beyond the borders of Potus 44’s America. It excludes places like Syria, where the death toll in its three-year conflict has climbed past 160,000 (averaging 146 a day), and Iraq, where 603 civilians were killed just last month, and hundreds more continue to be slaughtered daily. March 13, 1996 – Dunblane, Scotland – 16 children and one teacher killed at Dunblane Primary School by Thomas Hamilton, who then killed himself. 10 others wounded in attack. March 1997 – Sanaa, Yemen – Eight people (six students and two others) at two schools killed by Mohammad Ahman al-Naziri. April 28, 1999 – Taber, Alberta, Canada – One student killed, one wounded at W. R. Myers High School in first fatal high school shooting in Canada in 20 years. The suspect, a 14-year-old boy, had dropped out of school after he was severely ostracized by his classmates. Dec. 7, 1999 – Veghel, Netherlands – One teacher and three students wounded by a 17-year-old student. March 2000 – Branneburg, Germany – One teacher killed by a 15-year-old student, who then shot himself. The shooter has been in a coma ever since. Jan. 18, 2001 – Jan, Sweden – One student killed by two boys, ages 17 and 19. Feb. 19, 2002 – Freising, Germany – Two killed in Eching by a man at the factory from which he had been fired; he then traveled to Freising and killed the headmaster of the technical school from which he had been expelled. He also wounded another teacher before killing himself. April 26, 2002 – Erfurt, Germany – 13 teachers, two students, and one policeman killed, ten wounded by Robert Steinhaeuser, 19, at the Johann Gutenberg secondary school. 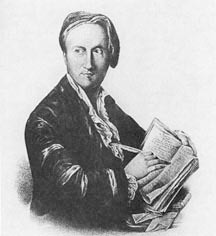 Steinhaeuser then killed himself. April 29, 2002 – Vlasenica, Bosnia-Herzegovina – One teacher killed, one wounded by Dragoslav Petkovic, 17, who then killed himself. Sept. 28, 2004 – Carmen de Patagones, Argentina – Three students killed and 6 wounded by a 15-year-old Argentinian student in a town 620 miles south of Buenos Aires. Sept. 13, 2006 – Montreal, Canada – Kimveer Gill, 25, opened fire with a semiautomatic weapon at Dawson College. Anastasia De Sousa, 18, died and more than a dozen students and faculty were wounded before Gill killed himself. Nov. 7, 2007 – Tuusula, Finland – An 18-year-old student in southern Finland shot and killed five boys, two girls, and the female principal at Jokela High School. At least 10 others were injured. The gunman shot himself and died from his wounds in the hospital. March 11, 2009 – Winnenden, Germany – Fifteen people were shot and killed at Albertville Technical High School in southwestern Germany by a 17-year-old boy who attended the same school. April 30, 2009 – Azerbaijan, Baku – A Georgian citizen of Azerbaijani descent killed 12 students and staff at Azerbaijan State Oil Academy. Several others were wounded. April 7, 2011 – Rio de Janeiro, Brazil – A 23-year-old former student returned to his public elementary school in Rio de Janeiro and began firing, killing 12 children and seriously wounding more than a dozen others, before shooting himself in the head. While Brazil has seen gang-related violence in urban areas, this was the worst school shooting the country has ever seen. July 22, 2011 – Tyrifjorden, Buskerud, Norway – A gunman disguised as a policeman opened fire at a camp for young political activists on the island of Utoya. The gunman kills 68 campers, including personal friends of Prime Minister Stoltenberg. Police arrested Anders Behring Breivik, a 32-year-old Norwegian who had been linked to an anti-Islamic group. March 19, 2012 – Toulouse, France – Mohammed Merah, a French man of Algerian descent, shot and killed a rabbi, two of his children, and another child at a Jewish school. Police believe he had earlier shot and killed three paratroopers. Merah said he was a member of Al Qaeda and that he was seeking revenge for the killing of Palestinian children. 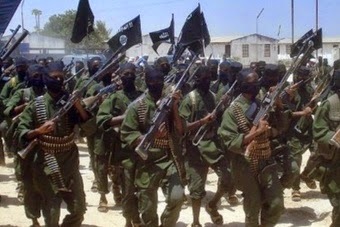 September 21, 2013 – Nairobi, Kenya – Shabab militants, who are based in Somalia, attacked an upscale mall, killing nearly 70 people and wounding about 175. The siege lasted for three days, with persistent fighting between government troops and militants. The attack was meticulously planned, and the militants proved to be challenging for the government to dislodge from the Westgate mall. There’s no place else like this? Borrowing from the Lonely Conservative, this week terrorists have taken over the cities of Mosul and Tikrit in Iraq. They had already taken control of Fallujah and the entire region is spiraling out of control. But, that didn’t stop White House spokesman Josh Earnest from proclaiming that ending the Iraq war is one of the administration’s major accomplishments. The only problem with this unsound proclamation is that a war isn’t over until someone surrenders. Where’s the peace treaty? Have Al-Qaeda and its affiliates surrendered? Has the Taliban laid down arms? Well, then who in the hell surrendered? Oh, I see. It seems we did. Hmmm, let’s think of it this way. If a band of terrorists parachuted onto the White House grounds, summarily executed Potus, then declared that the war was over and returned to their milk and honey farms, I suppose we could just accept this and go back to our busy lives, and perhaps some of us would want to, but I suspect most of us would be ready for war. For us, this would be more like the beginning, or a new beginning, rather than the end. But perhaps I stand alone. Apparently we’ve forgotten about Hiroo Onoda, the Japanese soldier who continued fighting World War II a full 29 years after Japan surrendered. He continued to fight because he didn’t know the war was over. Despite numerous attempts to inform him and a few remaining cells of soldiers, by dropping leaflets with orders to surrender from General Yamashita, followed by more leaflets with newspapers from Japan, photographs, and letters from the soldier’s families, and despite sending delegates from Japan begging over loudspeakers to give themselves up, Onoda refused to believe the war was over. Japan surrendered on August 15, 1945 and signed the instrument of surrender aboard the USS Missouri on September 2, 1945, officially ending the war. Hiroo Onoda didn’t surrender until March 10, 1975. It’s too bad we can’t just solve problems by declaring them fixed, and hoping and wishing the rest of the world conforms. No, it doesn’t work like that. Were it that simple, we could declare our Southern border secure, our immigration problem solved, and it would be so. If the war in Iraq is over, I hope to God the enemy knows. Please tell me we at least dropped a C-130 full of leaflets indicating such before we left. If the war on terror is over, please tell me it was Al-Qaeda and its affiliates who surrendered. And as for those top level Taliban Commanders we just released from Guantanamo Bay, somebody please, please tell me they signed a peace treaty before we dropped them in Qatar. I can think of several other situations negatively impacting our Nation’s voluntary tax system and generating widespread distrust of the IRS. Former IRS Official Lois Lerner’s use of executive privilege in targeting Barack Obama’s political opponents comes to mind, but I digress. What’s on my mind today are sources of identity theft. I personally know several people who have been victims of income tax related identity theft. At least two have had to wait more than a year to receive legitimate refunds from the IRS. In one case over $8,000 was delayed over a two-year period. When it comes to the process of having income tax withheld at the source, perhaps it’s better to underpay. Whenever I hear about a case of tax related identity theft, the question I always ask myself is how the thieves were able to obtain the victim’s personal information. The answers I found are shocking. The major sources of income tax identity theft appear to be healthcare providers, including doctor’s offices, nursing homes and even veterans hospitals, but even more disturbing, from within the IRS itself. On December 10, 2013, in the Northern District of Georgia, IRS Tax Examining Technician Missy Sledge was indicted for aggravated identity theft and mail fraud. According to court documents, as part of her official IRS duties, Sledge had access to taxpayers’ personal identifiers, including names, Social Security Numbers (SSN), dates of birth, and addresses, and information about tax professionals. Sledge used this access in furtherance of an identity theft scheme which included the filing of fraudulent tax returns and the subsequent theft of refunds. With information from IRS computer systems, Sledge provided taxpayers’ personal information to her coconspirators. It was part of the scheme that others would file fraudulent tax returns with the IRS using the stolen identities of various taxpayers. Sledge used her IRS computer to review the fraudulent returns submitted to determine if she could release fraudulent tax refunds from those returns. When identified, Sledge would release the fraudulent refund for payment. Sledge further assisted those involved in the scheme in impersonating either the taxpayers or their authorized representatives so the taxpayers’ addresses of record could be changed to a fictitious address accessible to Sledge or others involved in the scheme. Sledge then caused the IRS to mail refunds in the taxpayers’ names to the fictitious address to be intercepted or stolen. On May 21, 2013, an individual was arrested in Texas and was found to be in possession of an IRS refund check in the amount of $595,901.97, along with three pages of internal IRS documents containing tax information for one of the identity theft victims. A review of IRS systems revealed Sledge made accesses to this taxpayer’s account, as well as to the taxpayer’s accountant’s information, on seven dates between February 2013 and May 2013. The victim was due a large refund because she had overpaid her estimated taxes. One of the perpetrators used the accountant’s information and Government-issued representative number to impersonate the tax practitioner in telephone communication with the IRS on March 5, 2013, to change the address on record from a North Carolina address to an address in Atlanta, Georgia. Sledge then released the $595,901.97 refund to the fictitious address. On May 23, 2013, an e-mail was sent from Sledge’s IRS e-mail account containing the personal information for two other taxpayers, a married couple. The e-mail included the taxpayers’ names, SSNs, dates of birth, address, and tax preparer’s information. A subsequent telephonic address change was made, changing the address of record from the taxpayers’ Massachusetts address to a Georgia address, and a refund in the amount of $961,779.33 was paid on or about May 31, 2013. Review of the IRS systems identified accesses to the taxpayers’ accounts by Sledge on May 23, 2013 and again in June 2013. TIGTA special agents arrested Sledge in Chamblee, Georgia on November 26, 2013. She entered a not guilty plea at her arraignment, held on December 19, 2013. From now on, I’m going to question anyone who asks for my personal information, and those that don’t really have a need won’t be getting it. For example, Why does my doctor need to know my Social Security number? As long as I’m paying cash, she doesn’t. I pity all the poor souls who recently published all of their personal information on the insecure Obamacare website. We’ll see how that works out. As far as trusting the IRS, that bridge is already pretty much burned to the ground. One of the greatest opportunities the federal government will ever have in positively impacting our Nation’s voluntary tax system and restoring trust in the IRS is to prosecute Lois Lerner, and if found guilty, lock her up and throw away the key. According to the latest report from the Bureau of Labor Statistics, the official unemployment rate for all Americans rose by 1.3% since Barack Obama took office. But over the same period, the unemployment rate for Black Americans jumped by 10.9%, and the number of unemployed Black Americans climbed by 19.1%. So are we better off than we were four years ago? You might be, but the Black Community as a whole definitely is not. So will 90% of Blacks vote to re-elect Obama anyway? You betcha, because it’s not about tangible results, or even the content of one’s character; shamefully for many it’s about the candidate’s skin color. Per the first chart above, the Official Unemployment Rate has increased slightly from 7.8% on January 31, 2009, to 7.9% by October 31, 2012, an increase of 1.3% (0.1 / 7.8). So the official unemployment rate isn’t any better than it was when Barack Obama took office, it’s about the same, or slightly worse. What about that? And according the second chart above, the Unemployment Rate for Black Americans jumped from 12.7% on January 31, 2009, to 14.3% by October 31, 2012, for an increase of 10.9% (1.6 / 12.7). 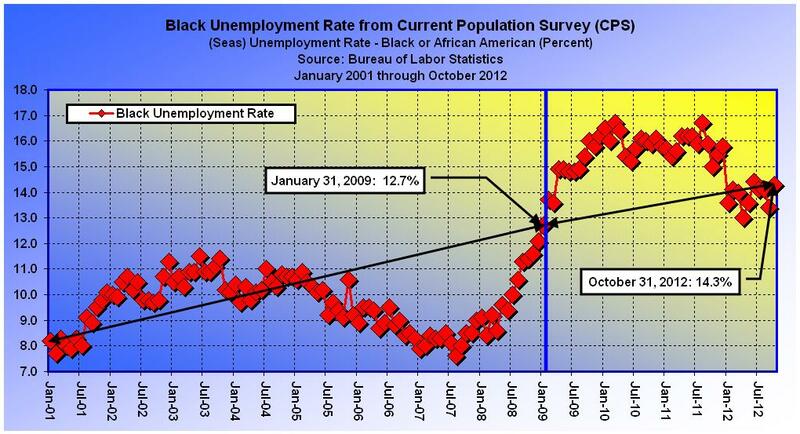 So the unemployment rate for Black Americans has continued to rise at a recessionary pace, in spite of Hope and Change. So what about that? 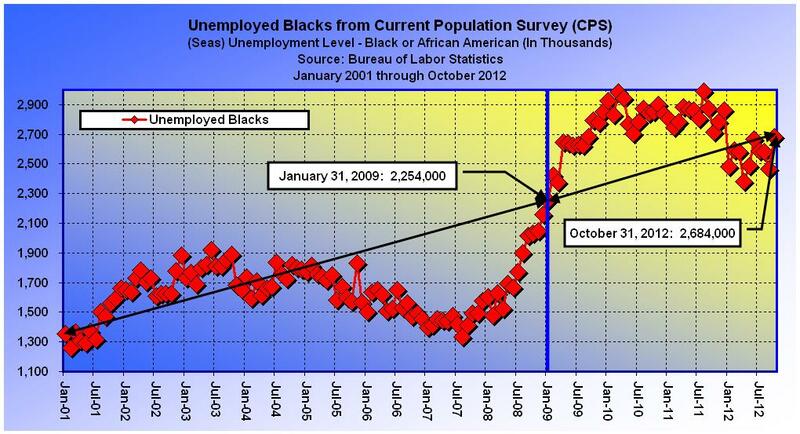 And according to last chart, the number of unemployed Black Americans has continued to surge at a recessionary pace, climbing from 2,254,000 on January 31, 2009, to 2,684,000 by October 31, 2012, for an increase of 19.1% (430,000 / 2,254,000). So the number of unemployed Black Americans, those who refuse to go on welfare or disability and remain in the labor force, has risen due to the countermanding policies of Barack Obama. What countermanding policies you say? Threatening to hike tax rates on the people who might have given someone a job instead. Forcing employers to provide health insurance to current employees, leaving no room for expansion or new hires. Spending borrowed money to subsidize solar panels, wind turbines, and battery operated vehicles, while the U.S. electrical grid remains vulnerable. Allowing strict EPA regulations to stifle jobs in the oil and gas, and mining industries. Increasing deficit-financed expenditures on Welfare, Food Stamps, and Disability as if that’s what Americans are demanding. Running up $5.3 trillion of debt in 4 years, the largest increase in our history, resulting in the first sovereign credit downgrade in American history. Well, you can’t have it both ways. You don’t achieve job creation through raising taxes, forcing employer mandates, social engineering, killing current jobs, offering free rides, or destroying the nation’s credibility. So admit it, Obama’s policies didn’t work. They didn’t work for Franklin D. Roosevelt, they have never worked, and they aren’t working today. So what now? More of the same, or will you dare to be different? Common sense dictates that if you want a different result, you must try something different. See you on Tuesday. Be there! 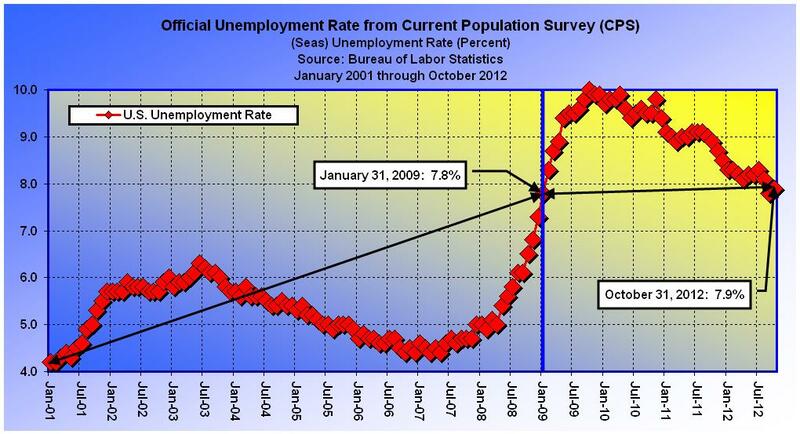 If the unemployment rate don’t fit, vote for Mitt! Has Obama Created More Jobs Than Bush Yet? 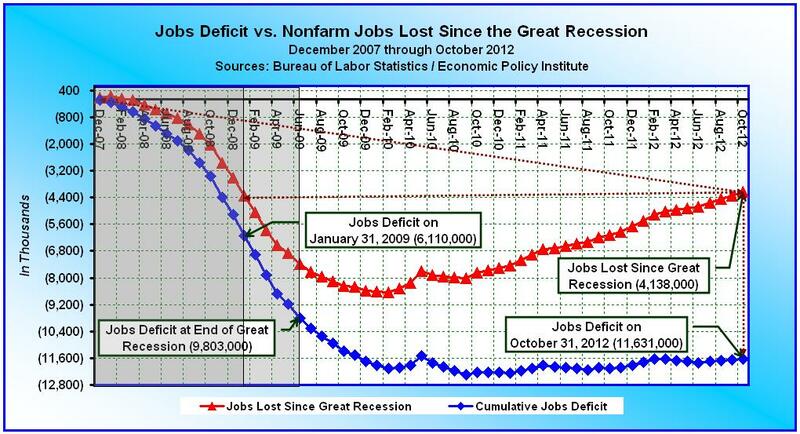 In the fairest sense, the U.S. Jobs Deficit has improved by an average of 30,000 jobs per month since January 1, 2011. And although this may be good enough for indifferent Obama loyalists, what it really means is that based on Barack Obama’s very best job creation averages to date, full employment is still another 32 years away. Based on yesterday’s Employment Situation Report, 171,000 nonfarm jobs were added in the month of October. However, since the U.S. needs to add a minimum of 320,850 jobs each and every month for the next 60 months in order to return to full-employment, October’s result fell short of the mark by 149,850. When the entire Obama record is analyzed, it turns out that U.S. employers have only added a total of 194,000 nonfarm jobs since February 1, 2009 (133,755,000 – 133,561,000). The jobs deficit has increased by 5,521,000 during Barack Obama’s 45-month term, from 6,110,000 on January 31, 2009 to 11,631,000 on October 31, 2012. The average number of nonfarm jobs created on a monthly basis in 2012 is 157,000, which is ironically the same as in 2011. In contrast, the average number of jobs created in 2010 was 86,000, compared to an average loss of (422,000) per month in 2009. So an average of 157,000 jobs a month, over the past 22 months, is the best that Barack Obama’s policies have been able to accomplish. This may sound great to some folks, but since 127,000 new jobs are required each and every month just to keep pace with population growth, what it really means is that we are clearly locked on a trajectory that chips away at the present 11,631,000 jobs deficit by a mere 30,000 jobs per month. So what does this mean in plain English? In other words, how many jobs must the U.S. create each and every month going forward in order to reach full-employment, and how long will it take? In order to keep up with population growth, we would need to create 127,000 jobs times 26 months, or 3,302,000. Add in the need to make up for the jobs deficit and we’re at around 14,933,000 (3,302,000 + 11,631,000) over the next 26 months — or 574,346 jobs a month. In order to keep up with population growth, we would need to create 127,000 jobs times 60 months, or 7,620,000. Add in the need to make up for the jobs deficit and we’re at around 19,251,000 (7,620,000 + 11,631,000) over the next 60 months — or 320,850 jobs a month. Did the U.S. add 574,346 jobs last month? No. Did we add 320,850? No. In fact, according to the Bureau of Labor Statistics, the U.S. has only added 194,000 nonfarm jobs since Obama took office (i.e. February 1, 2009) (see related table). So what does that tell you? It tells me that Barack Obama’s economic policies have failed miserably. He’s the one who said, “If I don’t have this done in three years, then there’s going to be a one-term proposition.” So don’t blame conservatives and independents when the earth slides from under his feet on Tuesday. In the fairest sense, when we average the number of jobs created over the last 10 months, we arrive at 157,000 a month. And when we average the number created in 2011 we ironically get 157,000 as well. Do the math. So in other words, there has not been any improvement this year over last year. So we’re not moving forward after all, we’re stuck in neutral. And since we know that it takes a minimum of 127,000 jobs a month just to keep up with population growth, we are only chipping away at the 11,631,000 jobs deficit by 30,000 jobs a month (157,000 – 127,000). Thus, on the current trajectory, full-employment is roughly 388 months — or 32 years away. So four more years of Obama’s trickle-down-government approach places us on the track to reach full-employment by around the year 2044. And that’s giving him the benefit of the highest job creation averages achieved during his entire presidency. I’ll be 84 years old by then, and my one year old twin granddaughters will be 33. I’m sorry, but no matter how you spin the numbers, Barack Obama isn’t worthy of a second term. Until the number of Nonfarm jobs is expanding by a minimum of 320,850 a month for a sustained period of at least five years, anything short is bad news. The Romney-Ryan Team is the only one on the ballot with a plan targeted to come anywhere close to what’s needed. Aside from that, with the national debt already beginning its ascent towards $20 trillion, with 25 million Americans unemployed or underemployed, with the Federal Reserve devaluing our currency by printing money to purchase mortgage-backed debt on an unlimited basis, with our tax and regulatory structure mired in uncertainty, with a foreign policy meltdown, and with the price of gasoline hovering above $3.25 for a record 86 consecutive weeks, there is absolutely, positively, no reason to consider a second Obama term. None! MythBuster III: Rational or Ridiculous? Card stacking, or selective omission, is one of the seven propaganda techniques identified by the Institute for Propaganda Analysis. It involves only presenting information that is positive to an idea or proposal and omitting information contrary to it. 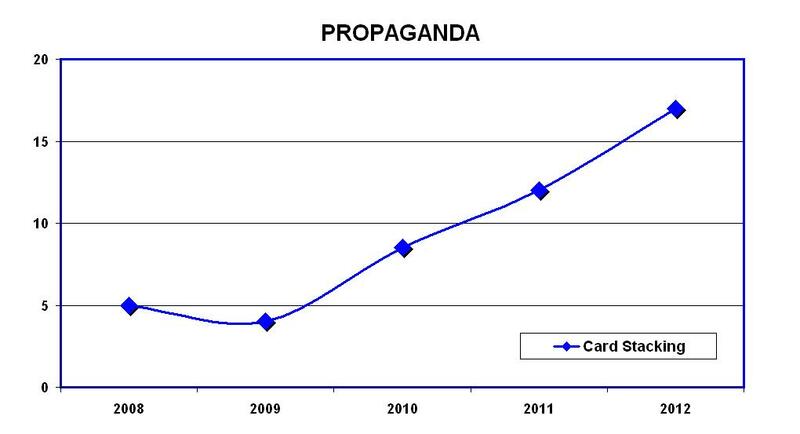 Card stacking is used in almost all forms of propaganda, and is extremely effective in convincing the public. Although the majority of information presented by the card stacking approach is true, it is dangerous because it omits important information. The best way to deal with card stacking is to get more information. Back in October of 2010, the left-wing media and White House tried to spin the myth that, “Obama created more jobs in 2010 than Bush did in eight years.” However, this delusion was busted in the first MythBuster series (here), simply by proving that at the time, not one single solitary job had been created during the Obama Administration. In fact at the time Mr. Obama was proudly presiding over a 2,991,000 loss in private sector jobs. So where are we today, 2 years later and 44 months into Mr. Obama’s agenda? 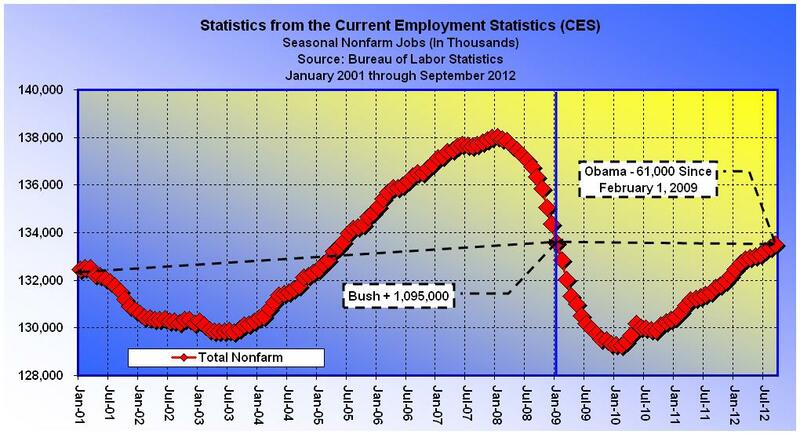 Has Obama created more jobs than Bush? Let’s turn to the Bureau of Labor Statistics, focusing first on the Current Employment Statistics (CES). The CES is a monthly survey of about 141,000 businesses and government agencies, representing approximately 486,000 individual worksites, in order to provide detailed industry data on employment, hours, and earnings of workers on nonfarm payrolls, also known as Table B. When we add up the total number of nonfarm jobs created during Mr. Obama‘s 44-month tenure (February 1, 2009 to September 30, 2012), we find that a total of 61,000 jobs have been lost (133,561,000 – 133,500,000). Thus, Mr. Obama’s job loss average is 1,386 jobs per month. Oops! And when we add up the total number of nonfarm jobs created during Mr. Bush’s 96-month tenure (February 1, 2001 to January 31, 2009), we find that a total of 1,095,000 jobs were created (133,561,000 – 132,466,000). So Mr. Bush’s job creation average was 11,406 jobs per month. Therefore, in terms of the CES, Mr. Bush’s job creation record was 922.9% greater than Mr. Obama’s [(11,406 + 1,386) / 1,386]. Oops! Just to be fair, we’ll return to the Bureau of Labor Statistics, this time focusing on the Current Population Survey (CPS). The CPS is a monthly survey of households conducted by the Bureau of Census for the Bureau of Labor Statistics, also known as Table A. The CPS is a broader survey, which includes those who are self-employed or who work for smaller companies. It’s also the data set used to calculate the official unemployment rate. When we add up the total increase in the employment level during Mr. Obama‘s 44-month tenure (February 1, 2009 to September 30, 2012), we find that a total of 787,000 jobs have been created (142,974,000 – 142,187,000). That’s an average of 17,886 jobs per month, which is at least positive, although far short of the four or five million he esteems. Yet, when we add up the total increase in the employment level during Mr. Bush’s 96-month tenure (February 1, 2001 to January 31, 2009), we find that a total of 4,409,000 jobs were created (142,187,000 – 137,778,000). That’s an average of 45,927 jobs per month. Thus, in terms of the CPS, Mr. Bush’s job creation record was 256.7% greater than Mr. Obama’s (45,927 / 17,886). Oops! The claim, “Obama created more jobs than Bush did in eight years,” is officially busted. Although I could cherry-pick and find a period where nonfarm jobs growth was up by 7 or 8 million during Mr. Bush’s term, for example from 2003 through 2007, and use that to pummel Mr. Obama’s record into the ground, I choose to remain among the rational. I don’t want to hear another word about Obama having created four of five million jobs over some arbitrary period. Most of us would agree that Mr. Bush’s job creation record was pretty dismal, but compared to Mr. Obama’s record, we were far better off during the Bush years. The truth is that the number of nonfarm jobs (CES) grew 922.9% greater during Bush’s 96-month term, in spite of the massive losses incurred during two recessions, than during Mr. Obama’s 44-month term. 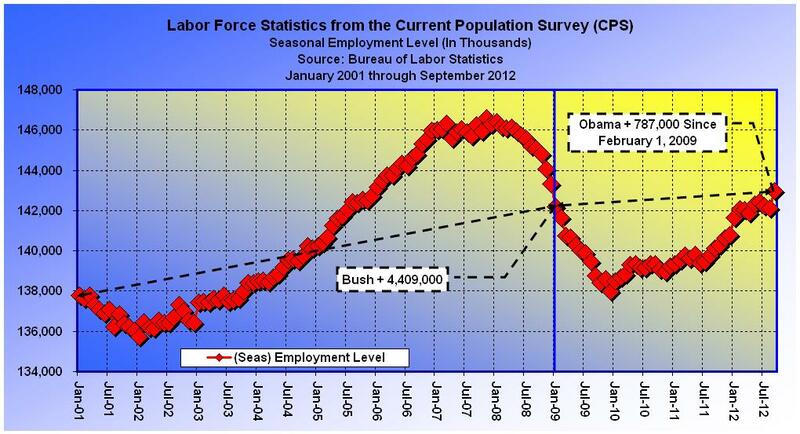 And likewise, the employment level (CPS) grew 256.7% greater during Bush’s term, than during Mr. Obama’s. We are currently around 4 or 5 million jobs short of where we were before the Great Recession. Frankly, Mr. Obama’s job creation record is ridiculous, pathetic, and unacceptable. He should be ashamed, as should anyone attempting to spin such trifle. It’s time to throw the bums out.